This week’s snow days did not stop our talmidim from learning. 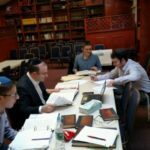 Rebbeim held shiurim via video chat and teleconference, with talmidim participating across the tri-state area, and even from Poland! Click here and here to listen to the audio recordings from Rav Tanchum Cohen’s snow day shiurim.